A longer version of this article originally appeared in Truthout. Reprinted with permission. 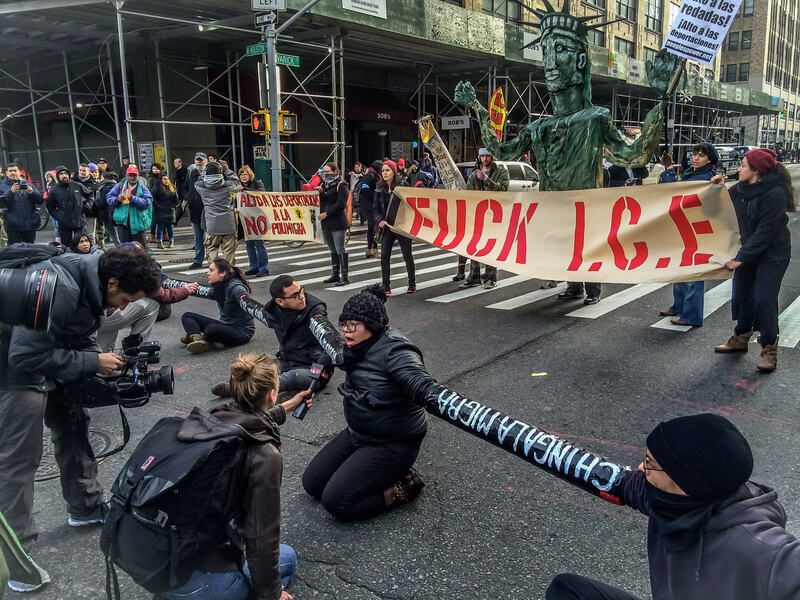 After being put in the back of a car, José was driven to the Immigration and Customs Enforcement (ICE) field office in St. Louis. He said that one the worst parts of the experience was not receiving anything to eat the first 24 hours he was in ICE custody. It was “very difficult,” José said in an interview. He currently has a deportation case pending, so he has been given a pseudonym to protect his identity. Stories like José’s have become increasingly common since the beginning of the new Priority Enforcement Program (PEP). Due to this new policy, Champaign-Urbana has seen more than 20 ICE arrests since Summer 2015. Hundreds of immigrant families from Central America seeking refuge in the United States were targeted by ICE in a series of New Year’s raids in the first days of 2016. But this was only the most visible campaign in the recent shift of policy. Yet much like the earlier program, ICE is still going after people with relatively minor charges, mostly DUIs. In many ways, these aggressive new tactics are worse than the previous ones, and have set off a wave of fear in Latino communities. By mid-2014, Secure Communities, the policy that won Obama the title “Deporter-In-Chief,” had become unenforceable. An April 2014 ruling in the case of Miranda-Olivares v. Clackamas County found holding someone on a 48-hour immigration detainer, the key function of Secure Communities, to be illegal. One of the earliest to withdraw from Secure Communities was Champaign-Urbana. In 2011, the Immigration Forum came together to convince the sheriff to opt out. In response to the failed Secure Communities, the Obama administration crafted PEP. On November 20, 2014, Jeh Johnson, Department of Homeland Security (DHS) Secretary, released a memo outlining guidelines for PEP. It places an emphasis on immigrants who were engaged in terrorism, participated in street gangs, and had previously been apprehended for unlawful entry into the United States. Listed under “Priority 2” are other offenses such as burglary, illegal gun possession, sexual abuse, and drug trafficking, as well as more common charges like Driving Under the Influence (DUI) and domestic violence. Most are being arrested on these lower priorities. In fact, under PEP, ICE agents have the authorization to take even bolder actions. Now instead of just picking them up at the jail, as they did with Secure Communities, ICE is going straight to people’s front door, their place of employment, or the county courthouse to find them. There is a growing Latino community in Champaign-Urbana, many of whom have gained citizenship, and some who remain undocumented. Latino immigrants clean hotel rooms, mow lawns, and cook in back kitchens. Some come as seasonal workers who toil in the corn fields managed by multinational agribusiness giants like Monsanto and Archer Daniels Midland (ADM). Because students drive up the cost of housing, many local immigrants like José live in trailer parks on the outskirts of the city. They also reside in small, economically depressed towns like Rantoul, just 20 miles from Champaign-Urbana, where the immigrant population has tripled in the last 15 years. Many work at the local pork plant, Rantoul Foods. Empty barracks and an abandoned hospital at a closed Air Force base provide housing. Some have been here long enough to save up for a house, which can be purchased for as cheaply as $40,000. José first came to Champaign-Urbana from Mexico some 20 years ago and has never sought to gain citizenship. He has easily found work and been willing to labor long hours to provide for his family. José has two children, both of whom were born in the US and attend local public schools. In the past year, José was arrested after police were called for a minor domestic incident involving one of his teenage children. He paid his fines and has been dutifully attending anger management classes. But his arrest put him on ICE’s radar. After spending three days in a jail cell in St. Louis, José had a hearing over a video screen with a judge in Kansas City, Missouri. José was then sent to the Tri-County jail in far southern Illinois where three of the counties are so small that they chipped in to share the costs of operating the jail, which was built in 1997. It’s located in Pulaski County, in the town of Ullin, with a population of less than 500 non-incarcerated residents, about 80 of whom work at the jail. Many have heard of the “prison town,” but this oddity may more aptly be called a “jail town.” The counties have a few dozen people housed in the jail, and the majority of the 230 beds are rented out to ICE. José said that inside the jail there were “many Latinos,” several he talked to who were there for DUIs. It took him about a month to raise the $10,000 bail before he was released. He currently has deportation proceedings against him, for which he had to spend another $5,000 to hire an attorney. Fortunately, he was able to return immediately to work after getting out of jail. A snapshot of the population at the Tri-County jail on October 1, 2015 was obtained through a public records request. It shows on that day 118 people were being held for ICE. A category of what are called “Fugitive Operations” includes a total of 26 individuals who were swept up under the new PEP mandate. In these cases, teams of ICE agents travelled hundreds of miles to knock on the front doors of wanted individuals. Of the 26 missions carried out by ICE agents, 17 were for DUIs. Only one person had charges of terrorism in a case that dated back to 2008. (There are no names provided, so it is impossible to research the charges.) The wide majority caught up in these raids are not those named as top priorities. In Urbana-Champaign, members of the Immigration Forum have been tracking the stories of José and others visited by ICE since the summer. They have identified at least 20 people who have been arrested. Most tell stories of ICE showing up at their front door looking for someone. ICE picked up one person at the nearby hog plant. In a couple incidents, they met people at the courthouse who were showing up for their hearings. Several have been picked up for DUIs. Representatives from the group have held workshops with concerned families in the local public schools to quell fears and teach people their rights.